Fifty-six percent of Latinos in the U.S. use the internet. By comparison, 71% of non- Hispanic whites and 60% of non-Hispanic blacks use the internet. 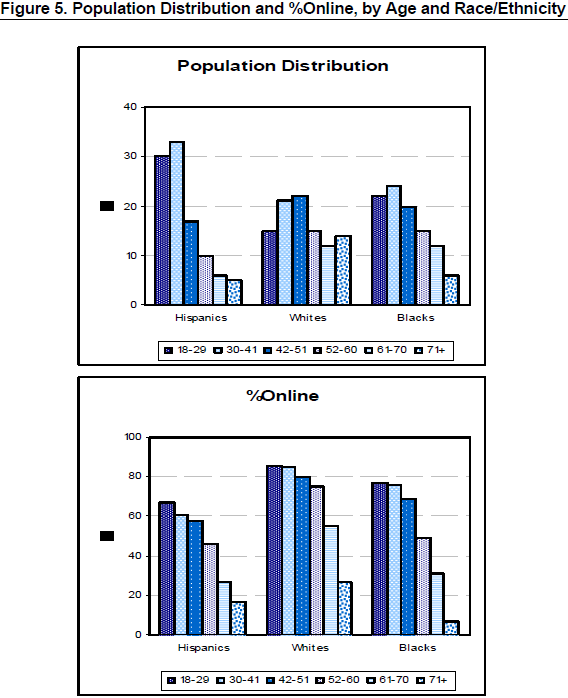 Much of the difference in internet usage between Hispanics and non-Hispanics is explained by socio-economic differences in the composition of the groups. These characteristics are often intertwined, especially in the Hispanic foreign-born population and it is difficult to isolate one as more important than another. However, race differences in education and English abilities stand out as factors essential to explaining the gap in internet use between Hispanics and non-Hispanics. Individuals who have not graduated from high school are much less likely to use the internet regardless of their racial or ethnic background. Four in ten Hispanic adults have not completed high school, compared with about one in ten white adults. Therefore the low rate of high school completion among Hispanics contributes to their relatively low internet use. In a statistical analysis of the survey results, we neutralized the differences between Latinos and whites in their educational profiles and the result was that their overall rate of internet usage was the same. Among the variables unique to the Latino population, language is highly significant in predicting a wide range of attitudes, behaviors and socio-economic outcomes, and, as this study demonstrates, internet use is among them. Fully 78% of English-dominant Latinos use the internet, compared with 32% of Spanish-dominant Latinos. Again, as a matter of statistical analysis, if one neutralizes the differences in English proficiency, then the differences in the rate of internet usage between Hispanics and non-Hispanics disappear. Ten percent of Latinos have a college degree, and of that small group, 89% go online. Half of Latinos (49%) have finished high school, and of those, 70% use the internet. Forty-one percent of Latinos have not finished high school, and of those, 31% use the internet. The strong connection between advanced education and internet use does not diminish when other factors (age, income, language, nativity, generation, country of origin and, for immigrants, years spent in the U.S.) are held constant. By comparison, 28% of whites are college graduates, and of these 91% report using the internet. Twenty percent of African Americans are college graduates, and 93% report using the internet. About 60% of white and African American respondents are high school graduates, with 69% of the whites reporting internet usage, and 62% of the African Americans. Only 12% of whites and 21% of African Americans have not finished high school, and their rates of internet usage are 32% and 25% respectively. Seventy-seven percent of respondents provided information about their household income; 23% did not and are not included in the following analysis. Nine in ten Latinos (88%) with an annual household income above $50,000 use the internet; 72% of Latinos with an annual household income between $30,000 and 49,999 use the internet. Thirtynine percent of Latinos with an annual household income less than $30,000 go online. Higher income levels are associated with internet use, even controlling for age, education, language, nativity, generation, area of origin or, for immigrants, the number of years they have lived in the U.S. Both white and African American respondents have higher annual household incomes than the Latino sample and, as is the case with Latinos, the likelihood of internet use increases with higher income. 67% of Latinos, 77% of African Americans, and 86% of whites age 18-29 use the internet. 61% of Latinos, 77% of African Americans, and 85% of whites age 30-41 use the internet. 58% of Latinos, 69% of African Americans, and 80% of whites age 42-51 use the internet. 46% of Latinos, 49% of African Americans, and 75% of whites age 52-60 use the internet. 27% of Latinos, 31% of African Americans, and 55% of whites age 61-70 use the internet. 17% of Latinos, 7% of African Americans, and 27% of whites age 71 and older use the internet. Statistical analysis indicates that age becomes a less significant characteristic in predicting internet use among Latinos when we take language, nativity, generation, or years in the U.S. (for immigrants) into account. Controlling for education or income has no effect on the association of age and internet use among Latinos. The Pew Hispanic Center has chronicled the effects of language on assimilation, as well as the differences between first-, second-, and third-generation Latinos.8 This survey extends that analysis into the digital realm, showing that speaking Spanish is a significant, independent factor in a Latino adult’s likelihood to go online. “Spanish dominant,” “English dominant,” and “bilingual” — determined by inquiring about a respondent’s ability to speak or read Spanish and English. Fully 78% of Latinos who are English-dominant and 76% of bilingual Latinos use the internet, compared to 32% of Latinos who are Spanish-dominant. This connection does not diminish when other factors are held constant, such as age, education, income, or nativity. Spanish-dominant Latinos are less likely to use the internet at all income and education levels, for example. 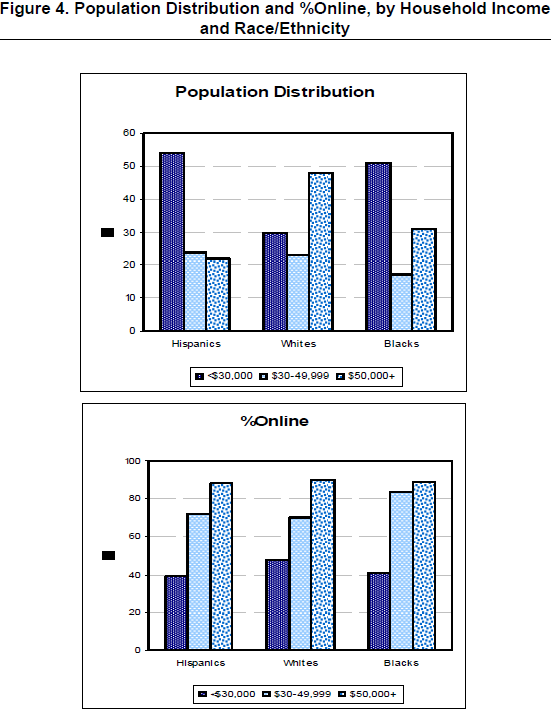 To illustrate the robustness of this association, Figure 6 displays the overall rates of internet use, as well as the rates of English proficiency for native-born and foreign-born Hispanics. It is very striking that the differences in internet use for each of the three language groups do not vary markedly by nativity. Nativity refers to whether a respondent was born in the U.S., in which case they are considered “native born,” or whether they were born in Puerto Rico or another country, in which case we call them “foreign born” or “first generation.” Among the native born, we further differentiate into two categories: “second-generation” Latinos were born in the U.S. but have at least one parent born in Puerto Rico or another country; “third-generation” Latinos were born in the U.S. to parents also born in the U.S.
Seventy-six percent of U.S.-born Latinos use the internet versus 43% of foreign-born Latinos. Second-generation Latinos, the sons and daughters of immigrants, are the most likely group to go online. Fully 80% of second-generation Latinos use the internet, compared to 71% of third-generation Latinos. This is significant looking to the future because the native-born segment of the Hispanic population is projected to grow more rapidly than the immigrant group. The connection between nativity, generation, and internet use remains strong even when other factors are held constant, such as age, education, and income. Again, language seems to have an independent association with the propensity to use the internet; foreignborn Latinos who speak English are more likely to use the internet than foreign-born Latinos who are Spanish-dominant, for example. Diversity of national origins is a hallmark of Hispanics in the U.S.9 Each group has a unique socio-economic profile, history, and mix of native born and immigrants, making national origin an essential part of our analysis of Latinos online. Mexicans are the largest national-origin group by far in the U.S. Latino population and are among the least likely to go online: 52% of Latinos of Mexican descent use the internet. This continues to be the case when other factors are held constant, such as age, income, language, nativity, generation, or time in the U.S. Mexicans’ low educational attainment largely explains this lower internet penetration rate. Sixty-six percent of Latinos of Puerto Rican descent use the internet. Compared with other Hispanics, Puerto Ricans are generally more likely to speak English and to have been born in the U.S. and, compared to other Hispanic immigrants, island-born Puerto Ricans have spent a relatively long time living in the U.S. These factors contribute significantly to the relatively high Puerto Rican likelihood to use the internet; in fact, when any of these factors are held constant, the internet advantage among Puerto Ricans is erased. Controlling for age, income, or education has minimal effect on Puerto Rican internet use. Latinos who trace their origins to Central America (which is comprised of El Salvador, Nicaragua, Guatemala, Belize, Honduras, Panama, and Costa Rica) are among the least likely to use the internet. Fifty percent of Latinos who trace their origins to Central America use the internet. The relative disadvantage of Central Americans in the U.S. is largely responsible for this pattern: if Central Americans had the levels of education or English proficiency of their other Hispanic counterparts, their internet use would rise markedly. The fact that they are disproportionately foreign born also plays an important role in explaining their low internet use. Their age composition, income, and years spent in the U.S. do not have dramatic impacts on the relatively low levels of internet use among Central Americans. Dominicans are in line with the general Hispanic population when it comes to internet use: 59% of Latinos who trace their origins to the Dominican Republic go online. The fact that many Dominicans speak mostly Spanish, and are predominantly foreign born somewhat suppresses their rate of internet use. Controlling for age, education, income, or the number of years spent living in the U.S. has little effect on the relative internet use of Dominicans. 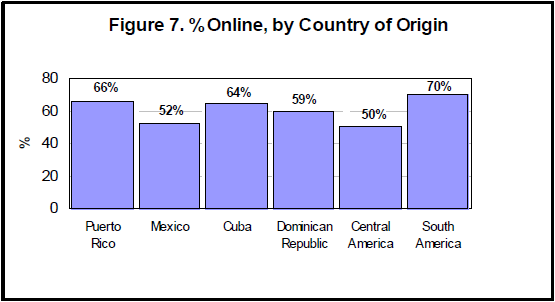 The rate of internet use among Cubans (64%) is similar to the rates among other Latinos. One factor that suppresses internet usage among Cubans is the fact that they are relatively old; if Cubans had the age profile of other Latinos, their rate of internet use would be significantly higher. Conversely, the fact that they are very well educated on average helps to drive the Cuban rate of internet usage up; were it not for their high levels of education, Cuban internet use would likely be lower than among other Hispanics. The same is true of the Cuban income distribution, to a lesser extent. Language, nativity, generation, and time in country controls have minimal effects on the relative internet use of Cubans. Latinos who trace their origins to South America have relatively high rates of internet use compared to the general Hispanic population: 70% of Latinos from South American countries go online. If we control for the relatively high education rates among South Americans, this advantage declines somewhat, but still remains significant. The high rates of South American internet use do not change when age, income, language, nativity, generation, or, for immigrants, years in U.S., are held constant. 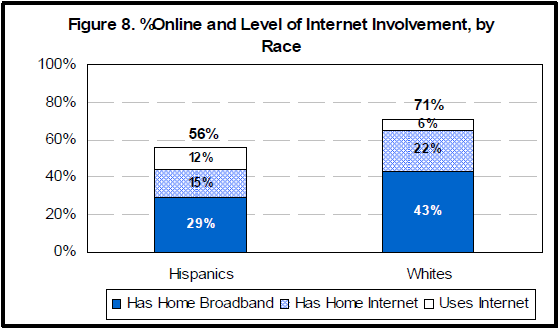 Overall, 29% of Hispanic adults have home broadband connections, compared with 43% of white adults. This difference is driven primarily by the fact that Latino internet users are less likely than non-Hispanic white internet users to have any kind of internet connection at home (79%, compared to 92%). Two-thirds of Latinos with home internet access have a broadband connection (66%, compared to 68% of whites with home internet access).